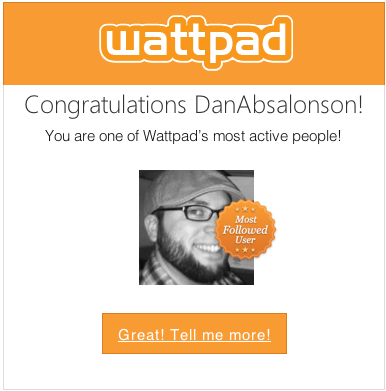 Dan Absalonson | Author of SciFi & Fantasy: Wattpad Emailed Me Today. So that's super cool! I have all of my stories up on Wattpad because it's an awesome place to share them and get feedback and read other people's stories and become part of an awesome community! I love Wattpad. It's also cool because as a reader you can read a story in your browser, or snag the app for every device you have and keep reading there. I have found some other writers on there and lots of great people who love to read and actually comment on your story. It is very hard to find that elsewhere. It's also quite difficult to find a place where so many people will read your work. Even if you don't get comments you can see how many people have read each chapter. You can use that as a tool, like if you have tons of readers but they all drop off at a certain chapter, maybe there's some revision or rewriting that needs to take place there. Below is the cool little widget Wattpad gave me for being one of the most followed user so of course I've got to share it with you! You can actually start reading my novel right in the widget. How cool is that? Give it a shot. I already have 9 chapters up there and more are on their way. As always thanks for stopping by! Dinosaurs: 51 Fabulous Facts is Online!